The Niah Caves in Sarawak, where one of the oldest anatomically modern human remains in Southeast Asia was found (approx 40,000 years old), has been put up by the Malaysian government for nomination as a World Heritage site. Will Niah caves achieve Unesco world heritage site? 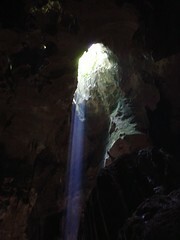 Sarawak is waiting for the Niah Caves to be inscribed as a World Heritage Site. Tourism and Heritage Minister Datuk Amar Abang Johari Tun Openg said the state, through the Federal Government, had nominated the caves for certification as a World Heritage Site in the middle of last year. The nomination had to be assessed by two panels – one at the national level and the other by the World Heritage Committee based at the United Nations Educational Scientific and Cultural Organisationâ€™s (Unesco) headquarters in Paris. I wonder if the fact they are now serving cocktails in the cave will help or hinder the application.